We have all been there: the moment another runner glides by easily with the smooth finesse of a panther, and instantly you feel the heaviness of a water buffalo in your own legs. All runners strive for efficient and speedy forward progress. 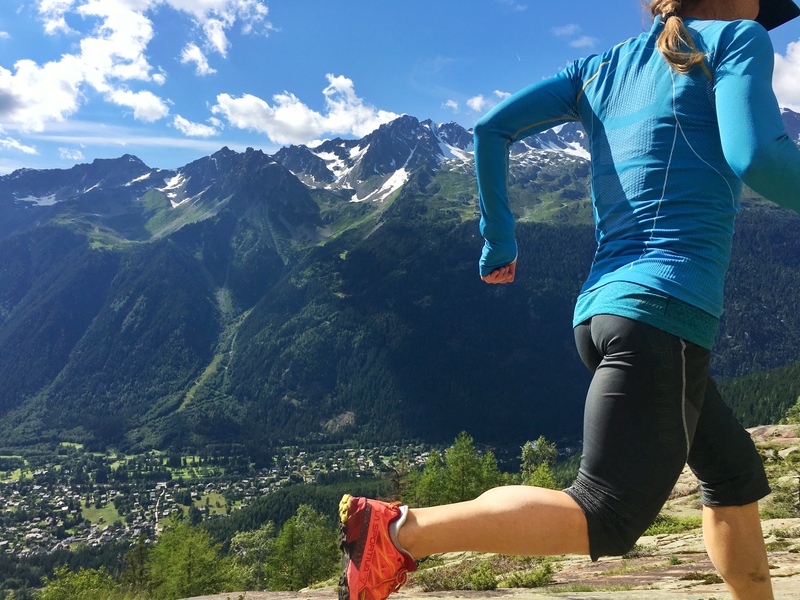 But despite hours of training and visualizing this process, most runners inadvertently underutilize their most valuable asset: the gluteal muscles. Ultrarunner Kristina Pattison on Lolo Peak near Missoula, Montana. Photo by Ben Herndon Photography. The gluteal muscles (glutes) at the back and sides of your pelvis work together to stabilize your leg as you land, and extend your hip powerfully to propel you forward. Stabilization is important to keep the knee from caving in every time you land, and propulsion contributes to forward speed and uphill power. All sorts of aches and pains are related to underutilized glutes, including runner’s knee, iliotibial band syndrome, hamstring strains, hip pains, even ankle tendinopathies and low back pain. The four motions you can practice to improve the strength and endurance of these muscles include hip extension (leg behind body), hip internal rotation (knee toward center), hip external rotation (knee out motion), and hip abduction (leg away from body). All these motions can be strengthened further by adding an elastic band for resistance. Perform hip extension by lying on your back with your feet planted and knees bent as far as comfortable. Start by contracting the abdominal and gluteal muscles to pull the pelvis and back into a neutral alignment. Use the glutes to lift the pelvis up off the ground, keeping the back straight from shoulders to sacrum. Tip: Challenge your abs by straightening one leg and lifting with the other leg one at a time. Perform hip external rotation by lying on your side with knees bent, feet together. Lift the top knee away from the bottom. Tip: you should feel this deep in the outside of the hip. Ensure your pelvis is perfectly still to obtain the correct motion. Perform hip internal rotation by lying on your side with knees bent, feet together. Lift the top leg slightly so it is hovering. Lift the ankle away from the bottom ankle, turning the leg inward. Again, keep the pelvis perfectly still. Perform hip abduction by lying on your side with top leg straight. Lift the leg away from the bottom leg. Keep the pelvis perfectly still and ensure your waist stays long. This should be felt in the muscles at the outside back of the hip, not the front. Tip: if you’re not feeling this motion at the side, ensure the hip is forward and heel is back. And try rotating the entire leg inward from the hip so the toes are down, or try the exercise lying on your belly. Kristina Pattison is an ultra endurance mountain runner and doctor of physical therapy from Missoula, Montana. She is currently focused on racing internationally in Skyrunning events and coaching select athletes. For information on coaching, please contact Kristina here.